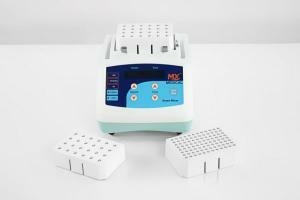 Vortex mixers are a critical piece of laboratory equipment used to mix samples rapidly. The small footprint and high rpm make vortex mixers a must on any lab bench. 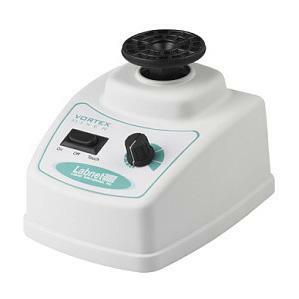 A vortex mixer is a relatively simple device, used in bioscience, microbiology, biochemical, and analytical laboratory settings to mix small vials of liquids in a quickly oscillating circular motion. When the motion of the rubber cup holder on the mixer is transmitted to the liquid sample, a vortex is created. Available in variable speeds, with the option of continuous function or on-demand function, the vortex mixer is a must workhorse for any lab bench. Next Day Science offers a wide range of vortex mixers, from multi-tube to pipette, with a variety of mixing options to meet every lab need. For more information, see specific product feature descriptions. Vortex mixers are mainly used to mix beakers or small vials of liquid. The device itself is straightforward, consisting of an electric motor with a vertical drive shaft. The machinery is typically attached to a rubber cupped piece that is slightly off balance. 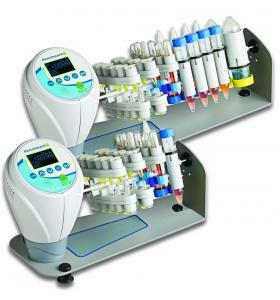 Simple mixers handle from one to a few vials, while more complex multi-tube mixers can handle dozens of vials. How does a vortex mixer work? In a vortex mixer, the motor drives the rubber cup in a circular motion to create a vortex, or spiral flow, in a sample. The idea is to place what needs to be mixed, such as a test tube, into the rubber piece so that it will rotate as well. Most vortex mixers have two or four plates and have several speeds, from a creeping 100 rpm to a vigorous 3,200 rpm, along with other programmable features. These can be set to run continuously or only when pressure is applied to the rubber cup. In what settings is a vortex mixer commonly found? Vortex mixers are most commonly found in bioscience laboratories. For instance, in the work of cell culture and microbiology laboratories, they are usually required to suspend cells which is a primary function of a vortex mixer. 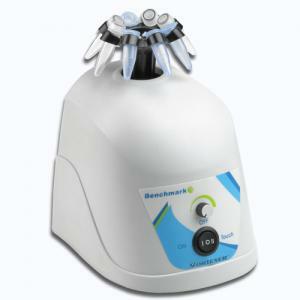 In biochemical or analytical laboratories, vortex mixers also are commonly used to mix reagents or to blend a sample and a diluent. Are there any alternatives to using a vortex mixer? If you want to go old school, you can use a “finger vortex” technique to mix your vial. This is done by manually creating a vortex by striking the tube forward and down with your finger or thumb. 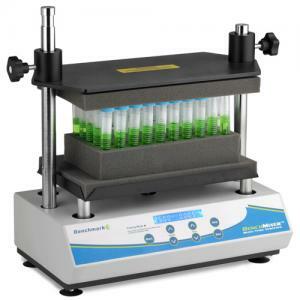 This can often result in incomplete suspension and takes a long time, but in a pinch, it can work in lieu of a vortex mixer or in situations when a vortex mixer would harm the sample. Note: Do not try this technique with caustic chemicals. What is the best way to gently and slowly create a vortex? When the vortex mixer is in motion, the liquid in your vial will begin to develop a vortex once it achieves a certain speed of rotational velocity. The process of developing the vortex can be slowed by running the vortex mixer at low speeds (or rpms), but at the end of the day a vortex mixer is made to create a vortex and mix liquids that normally would not combine. If you require a gentler form of mixing, you may want to consider using a shaker. Are there any additional applications for vortex mixers? 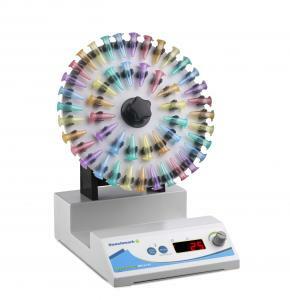 Vortex mixers are also useful for incubating culture, because they are able to create precise temperatures while mixing at a variety of speeds. 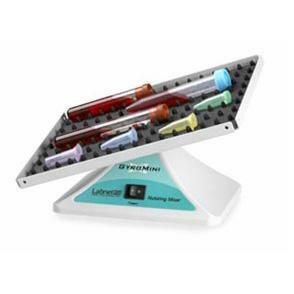 This is particularly useful for molecular biology procedures, such as enzyme and protein analysis. How is a vortex mixer different from a shaker? There are specific types of suspension that can only be done by creating a vortex, rather than just shaking a sample. For instance, a vortex mixer is able to mix viscous samples that would otherwise stay unblended. Literally, if you need to mix oil and water, a vortex mixer is the equipment you want to get the job done right. In addition, if you want to dilute an acid or an alkali by mixing with water, a vortex is the best way to get it done. When was the vortex mixer invented? The vortex mixer was invented in the 1960s by the Kraft Brothers as employees of Scientific Industries.